1 Announcer: Tonight from Heath Stadium here in rural Arkansas, you will see some of the most magnificent marching bands in America. The contests have been going on for days. Now we are down to the last five bands. At the end of the contest tonight, we will know which band is the best of the best! Mark Mynah is with us tonight. He will interview some of the band members. Mark, how is it going down on the field? 2 Mark: Fine, fine. Everyone is busy and excited. 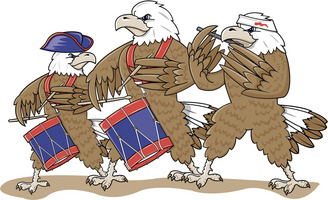 The three flamingos in the All-Bird High School Band are polishing their cymbals. Let's see if we can get a word with one of them. Hey, Frank! Frank, do you have time for a question? 3 Frank: Sure. What do you want to know? 4 Mark: I hear you are doing something special tonight. 5 Frank: Yes, and it will blow your mind! When we march onto the field, all one hundred twenty-five of us will be wearing pink uniforms. Our theme music is "Cherry Pink and Apple Blossom White." What do you think of that? 6 Mark: Well, that will be special, for sure. Thanks for your time. Now, let's move along to the Eagles from Symbols High School. They are taking a break. Let's talk to their director. Hey, Dave, will you tell us about the contest? 7 Dave: Surely, Mark. This is the Bands of Animals Grand National Championship. It happens every year right here at Heath Stadium. The best animal marching bands try their best to win the title of Animals' Grand Champion Marching Band. 8 Mark: Do you remember the smallest band that ever entered the contest?